Copper-bronze body; lighter in clear waters. 1 to many spots at the base of the tail. Mouth horizontal and opens downward. In winter, redfish are found in seagrass, over muddy or sand bottoms, or near oyster bars or spring fed creeks. Juvenile redfish are an inshore species until they reach roughly 30 inches (4 years). They then migrate to the nearshore population. 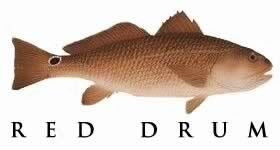 Red drum are one of Florida’s most popular sport fish and the state’s most widespread estuarine fish. Floating a live shrimp under a popping cork is a good way to fish for redfish. They also chase crabs, mullet, pinfish and killifish ( mud minnows ). Casting soft-bodied jigs, spoons and even top-water plugs will catch the attention of these powerful estuarine musicians. Redfish make great table fare. Redfish are prodigious spawners that produce tens of millions of eggs. Spawning season is from about August through December, in passes, inlets and lagoon estuaries around the state. During spawning season, redfish use special muscles rubbing against their air bladder to produce a "drumming" sound for which they are named.